(CNN) — The gunman who opened fire at a New Jersey mall Monday night is dead after holing up in a back room at the mall and shooting himself in the head, a local prosecutor said. Richard Shoop’s body was found at 3:20 a.m. Tuesday in an obscure part of Westfield Garden State Plaza mall, hours after he fired at least six bullets without striking anyone in the massive shopping center. 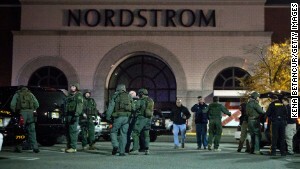 The shooting sent panic through the mall and set off a frenzied hunt for the gunman. In the early hours of the search, officials weren’t sure whether the shooter was still inside or outside the 2-million-square-foot building. “We believe that he went in there with the intent to either be shot by police, which we call suicide by cop, or to take his own life, which ultimately he did,” Bergen County Prosecutor John Molinelli said Tuesday morning. The melee started around 9:20 p.m. ET, just as the shopping center was about to close. Shoop, dressed all in black and wearing a motorcycle helmet, walked through the mall armed with a rifle modified to look like an AK-47. The rifle was taken from Shoop’s brother, Molinelli said. 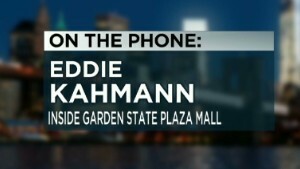 Eddie Kahmann, another mall employee, said he heard six or seven gunshots. “There was just people running like crazy, so I quickly just closed my doors, ran to the back, turned off all the lights, music and everything, just to stay hidden,” he said. The gunman had plenty of chances to shoot and kill anyone inside the mall. But he didn’t. Instead, the gunman fired toward the ceiling, an escalator, an elevator and a storefront, the prosecutor said. No one knows exactly why. Shoop, 20, was known by local law enforcement. He had a history of drug use and abuse, Molinelli said. “You wouldn’t think that at age 20, how much can you do in your life, but in his life, he at least thought that he was reaching a point where there was no recourse but to take his own life,” the prosecutor said. Authorities believe Shoop acted alone. But even as his body lay in a remote room in a construction area, fear still permeated the mall. More than 100 shoppers were still hiding inside stores early Tuesday morning, unsure of whether they could safely come out. Officers tried to evacuate each store. Authorities said Shoop left behind a note in the home where he was living. But the reason he went to the mall to spend his final moments remains unclear.